A newly developed FDA-approved technology, the VELscope System, may prove to be the most thorough tool designed to date that can detect oral cancer at its earliest stages. 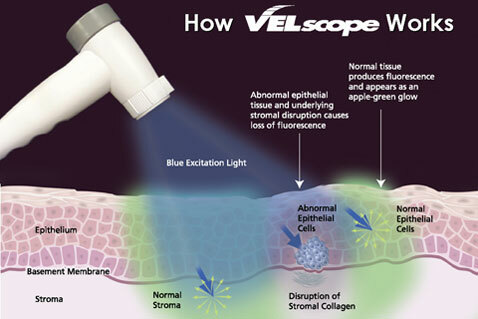 VELscope was developed by the British Columbia Cancer Agency and Vancouver-based LED Dental Inc. It is a revolutionary hand-held device that provides trained dentists and hygienists with a new tool to aid in the early detection of oral cancer. The VELscope examination is non-invasive, painless, and takes only a few minutes. The dentist shines a blue light into the mouth to cause it to fluoresce. The fluorescence helps to better visualize abnormal tissue, which may be, or may lead to, oral cancer. “We have always performed a thorough cancer screening examination as suggested by the American Cancer Society. The VELscope allows us to see underneath the surface where cancers develop before they can be seen with our eyes,” Dr, Marvin Fier, one of a small number of dentists nationwide to offer this technology explained. Over 34,000 people are diagnosed with oral cancer annually in the United States. With a morality rate of over 50 percent at 5 years, one person every hour of every day dies of oral cancer in America. If detected early however, oral cancer is 90 percent survivable. “We’ve always conducted a comprehensive annual oral cancer screening for all of our patients, but the VELscope System allows us to see things we’ve been unable to see previously. By detecting potential problems earlier, we’ll be providing our patients with the best oral health care currently available,” said Fier, who is one of the ten dentists nationwide participating in a pilot project, with the University of Louisville’s Division of Radiology and Imaging Science, to test the device.